Paddleboarding is a sport that has taken the world by storm. And why wouldn’t it? Paddle Boarding has some great health benefits. It offers a great workout, an opportunity to connect with others, and even the chance to participate in calm activities like yoga or travel boarding. To take part in this though, you are going to need the best SUP paddle. While most paddle boards come with paddles, these are not high-quality. Often, they do not float and they are cheaply made and heavy, which can ruin your paddleboarding experience. When you want the best to influence your experience, check out these top contenders for best paddle board paddles and the buying guide on how to choose the best sup paddle for you. 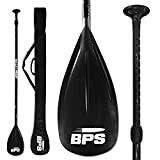 To see more of my top paddle boarding products why not check out our Best Inflatable Paddleboards reviews , Paddle Board Car Racks, Kids SUPS and PFDs. If you need an idea of where to start, here are some of the best paddles for paddleboarding and what makes them great choices. This paddle is on the higher price end, but its many great features make it worth the cost. This paddle comes in three different parts, which allow it to be carried easily. Even though the parts are detachable though, they snap together easily and securely. It features a 12-degree angle between the shaft and the blade and a dihedral blade, which concaves so you get more power with every stroke. The top of the shaft has a small ‘T-shape’ with a ball in the center, which is great if you like a hybrid grip. It can, however, be a little large for people with smaller hands. Even though the paddle comes apart in three pieces, the size is still adjustable. It can be as short as 72-inches and as long as 86-inches. This is a great choice for paddleboarders who like to adjust the paddle for the activity they are doing. In addition to coming in three separate parts, this paddle comes with a carrying bag. The pieces fit easily inside and it also protects your paddle from the heat. Another cool feature is that the paddle floats, which is especially useful if you are new or participating in an extreme paddleboarding sport where you may lose the paddle. This paddle is designed to separate into two pieces. This makes it easier to transport, but prevents problems that can happen with weakening of a third joint. The height of this paddle is adjustable, with a range from 71-inches to 83-inches for length. The handle of the paddle ends in a rounded, ball-like handle that is easy to grip while you are paddleboarding. Some people who are not accustomed to this grip may find that it is not secure enough for their preference. This SUP paddle is unique because of its alloy construction. The shaft is made of lightweight aluminum, while the blade is made of a composite nylon material. This makes the paddle lightweight, durable, and affordable, but not as durable as some other options. The paddle also floats. One downside of its aluminum construction is that some customers report it does not stand up well to aggressive use. The latch can break down over time or the shaft may bend. The quality of customer service provided after purchasing this paddle is outstanding. Upon purchase, you get a complete access to an e-guide, which helps with adjusting the paddle to your height and gives a few useful tips. There is also a 12-month money back guarantee, which the company follows through with without asking questions. This carbon fiber model features a carbon fiber shaft and a composite blade, which makes it more lightweight and more affordable than some other options. Like the previous models, this paddle features adjustable height. The major difference is that the mechanism is incredibly easy to use. Some people even say that it is so easy you can adjust the paddle while you are standing on your board in the water. The one downside is that the height adjustment has a little wiggle room so the shaft does not always feel solid. This paddle is made of a carbon fiber handle and shaft, paired with a blade made of nylon and fiberglass. One advantage of the composite blade over a carbon fiber one is that it does not chip easily. It is also less likely to damage your board if you hit your SUP accidentally while you’re out on the water. The other advantage is that the blade makes the paddle more affordable, at a little more than half the cost of most other carbon fiber paddleboard paddles. It is also incredibly lightweight, weighing just 1.7 pounds. The blade is angled and has a concave shape, to encourage a smoother ride while you’re out on the water. This paddle does not come apart, so it can be hard to transport if you do not have an SUV or another vehicle with plenty of storage space. It does, however, come with a convenient carrying bag. The carrying bag lets you transport it without worrying about sun damage (because it is UV reflective) or scratches. The two straps also allow you to easily carry it in your hand or over your shoulder. This is the most affordable paddle on this list, costing around $40. Its price does not sacrifice quality, though. One of the great things about this paddle is its height range, which goes down to 66-inches—lower than any other so far on the list. This makes it ideal for people 4’6” in height and taller, going up to a height of 83-inches. Its height is paired with a weight just over 2 pounds, making it ideal for small adults and children who might want to enjoy paddleboarding. This paddle comes apart in three parts, making it easy to break down and transport. The downside is that there is no carrying bag included like with some of the other models. The handle is rounded and both easy and comfortable to hold while maneuvering through the water. The shaft of the paddle is made of aluminum and the blade is made of a nylon composite material. This makes it very strong, but its strength does not make it heavy. The wide, rounded shape of the paddle makes it perfect for maximizing the power behind each stroke. The major disadvantage of aluminum is that it can rust with time, making it harder to adjust the height and take the paddle apart. The paddle is built to last and the company stands behind that with a 12-month warranty. It is also guaranteed to float in water during this period too, or you can get your money back without answering a million questions. This is another affordable paddle, costing around $40. It has an alloy construction and comes apart in three pieces. This SUP paddle is meant to be a beginner’s paddle, but that does not mean it will not last for years. Its aluminum shaft is durable and lightweight. It is also filled with foam tubes, which makes it float effortlessly on water. The blade of the paddle is made of nylon, which is a durable material. It also has a little give though, so you do not have to worry about damaging your paddle or your board if they come into contact while you’re on the water. It has a large, round shape which helps you grab the water and pull yourself through it. This is enhanced by the T-shaped handle that gives you a solid grip. The pole comes apart in three pieces, which helps carry it easier. It also is adjustable, which means people with a large range of height can use it. This makes it great for a family paddle or an extra to take along for a friend if you decide to upgrade after some paddleboarding practice. Sometimes, the lock/attachment pin can get stuck when assembling after you purchase the paddle. Fortunately, it is an easy fix if you use a little bit of grease. The way the pole is rotated can also affect it. The other included bonuses of this paddle are the included paddle bag and the warranty. The paddle bag has a thick foam padding and a nylon outer. Inside, a heat-reflective lining keeps the paddle cool inside the bag. Three loops hold each part securely in place while the padding protects from damage like scratching. The warranty is a great feature, with 100% satisfaction guaranteed. The customer can choose either refund or replacement if disappointed. This is a nice middle ground between the cheaper made options and the more expensive carbon fiber options. Like many others, this paddle comes with an adjustable height range for a wide range of users. The downside of its adjustability is the clamp, which does not always come assembled tight enough. Check for this out of the box—if you fix it once you probably will not need to do it again in the future. The fiberglass construction makes this paddle sturdier than aluminum options. This makes it ideal for people who want more power or speed behind their strokes. The nylon blade is sturdy and designed with rounded, dihedral shape that makes it perfect for activities like racing, surfing, and touring. One thing to note is that if you put the blade of the paddle in the water at the wrong angle, it splashes and you lose a lot of power. This can be a nuisance, but it can help improve your form if you regularly adjust to prevent this. This paddle is backed by a 12-month guarantee offering a full replacement. It is designed with great attention to detail, down to the stainless steel screws that hold everything together. This is a great paddle for beginners, as is has a rounded, squared-off shape that is forgiving in the water. These paddles are designed for the average beginner, who may drop their paddle. For this reason, they float in water. They are also durable enough to withstand some abuse. The height adjustability of these paddles makes them a good choice for people 4’8” and taller. They are also easy to adjust. The shaft is made of aluminum, but of an aircraft grade aluminum, which is higher quality than you see in most aluminum paddles. The blade of the paddle is made of a propylene material, which is incredibly durable. It is sturdy enough to give you a great grip as you move through the water and the angled design helps the stroke be smoother. The blade is separated from two other pieces of the shaft, since this is a 3-piece set. Like a few others on this list, the company stands behind the quality of their product with a replacement warranty. The major disadvantage of this paddle may require you to use the warranty—some users have reported that the handle at the top of the shaft loosens or even falls off entirely after a few months of use. Like paddleboards, paddleboard paddles come in different shapes, sizes, and materials. The one that you choose will affect the efficiency of your board, and ultimately the enjoyment that you get from your outdoor paddleboarding excursion. Here are the considerations you should make to choose the best paddle. Aluminum– Aluminum paddles are great for beginners and they are at the lowest end of the price range. They are also a good choice if you want to try out different paddle styles before making a decision on the ideal paddle, before making the commitment to a more expensive paddle. Carbon Fiber– This is the lightest and the strongest, compared to other materials. The lightweight is good for racing or endurance paddling and the good durability makes them stand up when pushing off of obstacles or handling rough water. The downside of these paddles is that they are the most expensive of the options. Fiberglass– Fiberglass is cheaper than carbon fiber, but a little denser. It is still a good choice though, being strong and light. This is in the mid-price range and is ideal for the intermediate boarder. As a general rule, you should fit the length of the paddle to your height. When the paddle is in an upright position, the topmost part should be 8-inches to 12-inches above you. A paddle longer than this will be hard to pull out of the water, while a paddle shorter than this will require more energy to paddle. An ideal situation is to purchase an adjustable paddle, but when that is not possible consider the activity and blade style too. The blade is the large shape on the end of the handle. Its shape is going to determine how much energy you have to expend and how it functions for your chosen activity. Considering blade style, you will need to think about both size and shape. Size makes a huge difference in how much energy you must expend. Larger blades have a greater surface area and greater resistance. This means that you must exert more force to pull them through the water. This is one of the reasons that small-to-medium-sized blades are recommended for beginners. They are also ideal for people who are not in great physical shape, but who still want to be part of the paddleboarding sport. The shape can also affect how quickly your board moves and how well you can maneuver it. Squared off blades are best when you value power behind your stroke. They are great when you want to move quickly or if you are racing. Rounded blades are great for handling large waves, because they cut more easily through the water. There are also blades that are slightly squared. These are ideal for endurance paddling, when you want to get the most out of your stroke and are going a long distance. Another element of blade shape is whether the paddle is flat or dihedral. Dihedral-shaped blades offer a smoother stroke, because their unique design reduces flutter. Flutter happens when a blade does not pull straight back following a stroke. This causes the blade to rock back and forth or wobble slightly. The downside is that you lose some power. Using a dihedral blade can also make taking a turn longer, which is not a good fit for surfers. For this reason, dihedral blades are typically preferred by beginners. Those who value quick turns or power behind their stroke usually choose a flat blade. Any SUP paddle that you buy will have an angled blade, meaning that the paddles blade does not run parallel to the shaft. This helps the blade glide more easily because it is not as forceful, prevents water from being lifted in the backstroke, and giving you a more powerful stroke overall. The most common paddles will have a 10% angle between the handle and blade, but it can range from 6%-12%. Usually, this depends on personal preference. The style of the grip will affect how comfortable you are while paddleboarding. You should always choose what makes you most comfortable and feels the most secure. Some have a ball shape on the grip that secures your hands, while others use a T-shape to do this. There are also ergonomically designed grips, created for people who value proper hand placement. This was chosen because it is a top-quality model with a fair price. The height is easy to adjust and the concave blade lets you move smoothly on the water. The blade is not carbon fiber, but is still durable and offers a great paddleboarding experience. Finally, while the paddle does not come apart, a carrying bag is included for safer, easier transportation.